Roger Miller, best known for his hit songs "King of the Road", and "Dang Me" was an uncategorizable talent. His music blurred the boundaries between the country and pop genres, giving him status as a major crossover artist. He held the record for the most Grammys ever won until 1983. Johnny Cash called him a "sparkplug" that ignited the creativity in others. Miller was an innovative songwriter with a lightening-fast wit. To those that knew him, Roger Miller was a genius in every way., writing dozens of hit songs, hosting TV shows and writing a Broadway musical. But with his "genius" came a dark side. In the 1960s and 1970s he was known to walk off stage halfway through a show, get into fights, and go days without sleep. He had a serious addiction to drugs, which cost him two marriages, a network television show, and possibly super stardom. 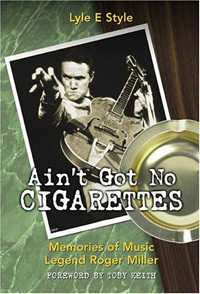 Ain't Got No Cigarettes delves into the amazing life of Roger Miller as told in interviews with some of the entertainment industry's biggest stars. Read untold stories of their own careers, their take on the business and most of all, why they all revered the legendary "King of the Road". Lyle E. Style is an author, actor and alternative country singer and songwriter who spent over four years documenting the legend of his hero Roger Miller.